You can add, edit and remove locations from the location management page. In addition, because locations can often be re-used, it is possible to unpublish and republish locations that are likely to needed in future. 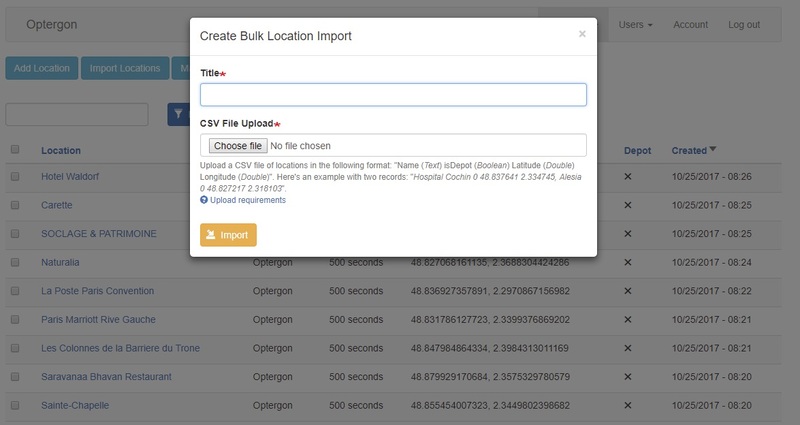 It's quick and easy to add locations in bulk using a csv file upload. 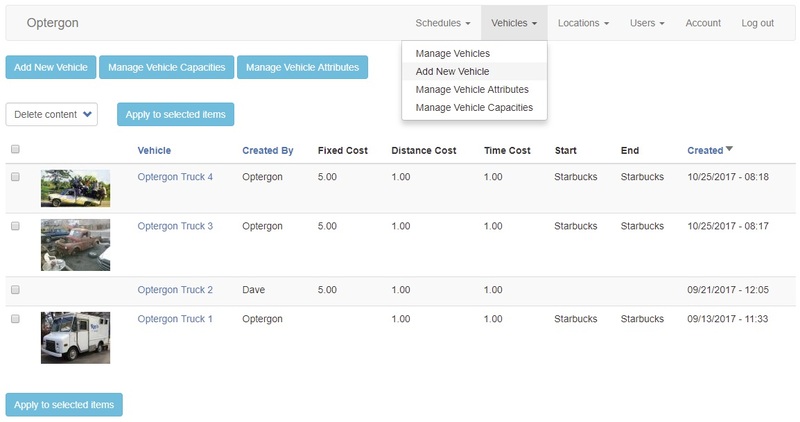 Like locations, vehicles can be added, edited and removed from a similar interface. Completely flexible vehicle attributes and capacities make it easy to model your real-world business perfectly. No matter whether you are transporting goods or people, it takes one click to add a new capacity that becomes available to all your vehicles. 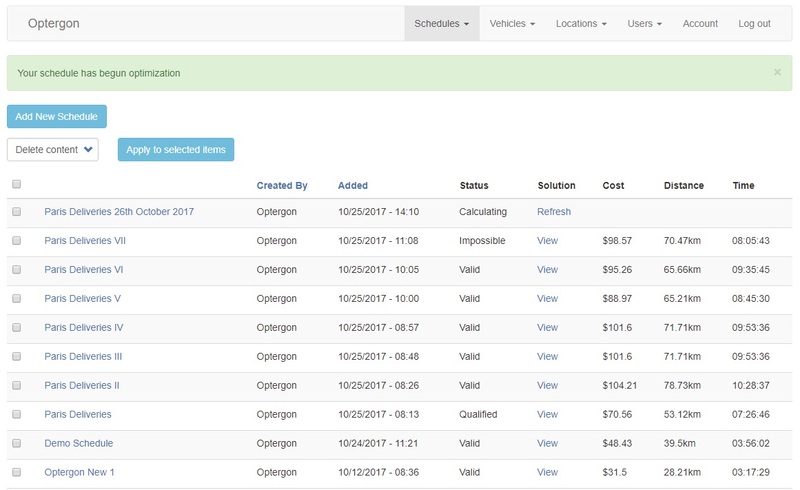 With all your locations and vehicles added to the system, creating a new schedule is a quick two-stage process. First, choose all the stop and vehicles to be included along with a few other configuration settings - like start and end dates. 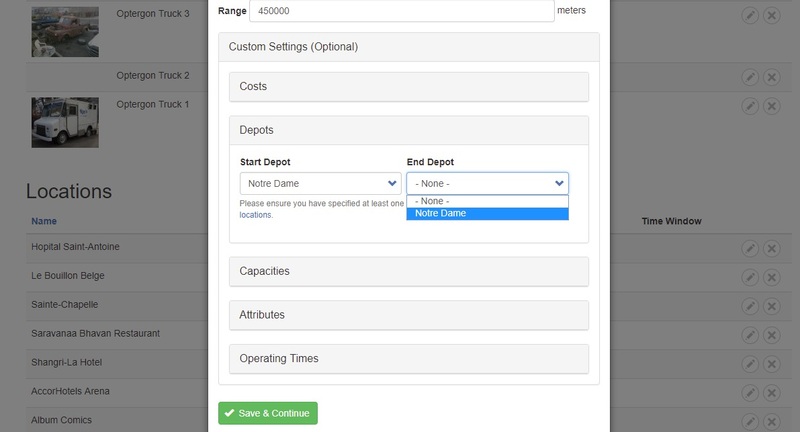 Next, configure the schedule to reflect its specific requirements. Each vehicle and location can be configured to match your real world system precisely via a range of settings. Once everything is ready, click Optimize. Once a schedule has been submitted for optimization, you will need to wait for us to crunch the numbers. This can take anywhere between a few seconds to a few minutes depending on how large the schedule is. 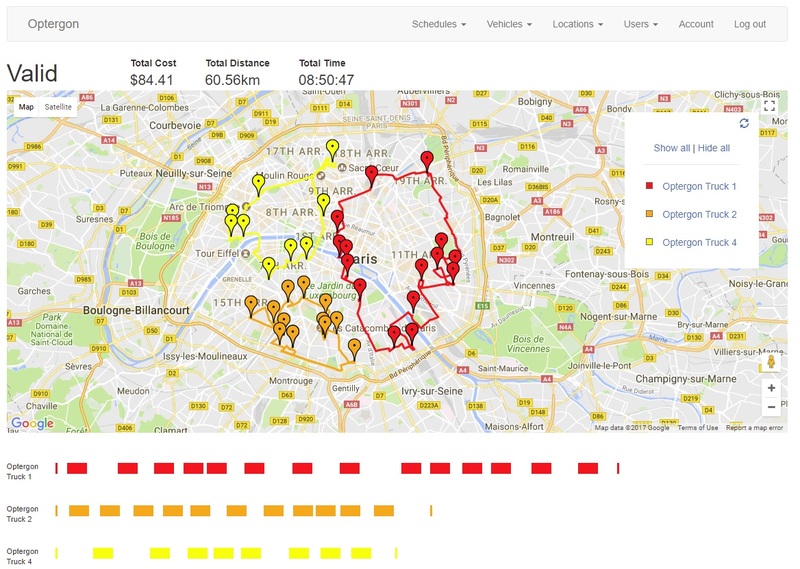 Once the optimal route plan has been calculated each vehicle is given its own in-depth schedule with drive and wait times, stop times and location order in an easy to use, interactive chart. 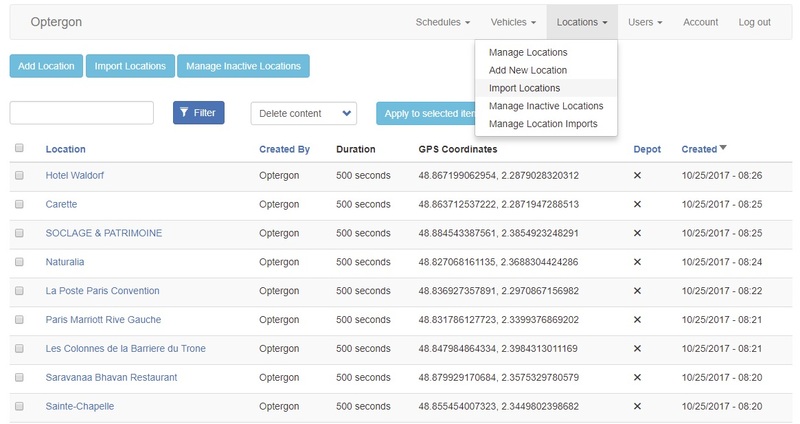 Once Optergon has generated a route plan there are several facilities to print, export (via JSON or XML for easy integration with your existing infrastructure) and share relevant parts of the solution with everyone from the Warehouse/depot manager to the drivers. 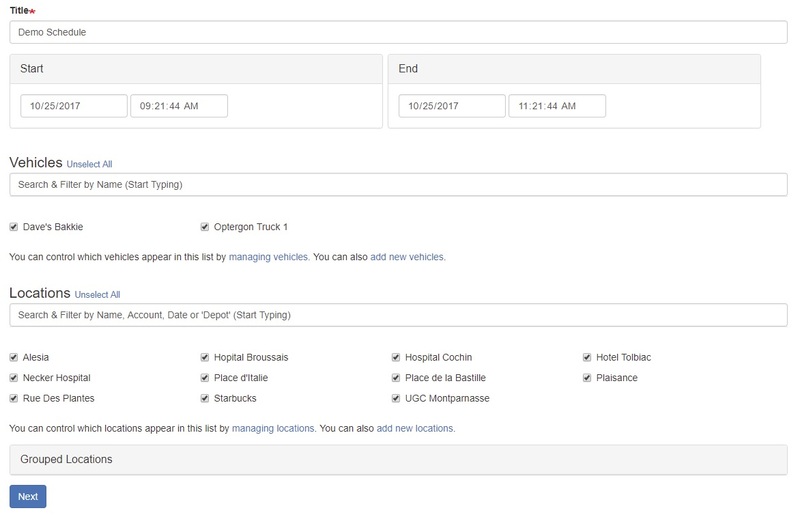 For example, it's possible to email a complete route map directly to the driver(s) of any vehicle used. 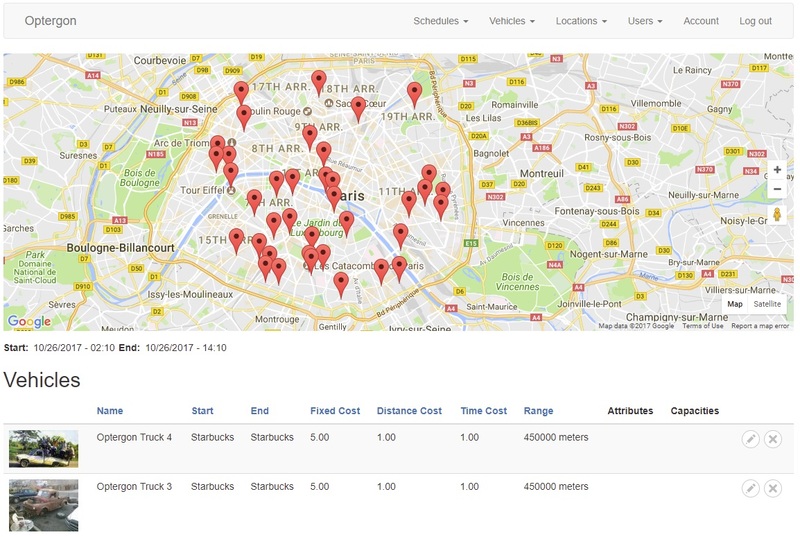 This results in an email that contains an ordered list of stops (with GPS points) and a departure time. It also links to an online map with step by step directions for the driver. The route map and directions provide turn by turn information as well as pictures and times with live traffic data. It can be shared to the driver's mobile at the click of a button. Create a free trial account and start streamlining your business right now (no credit card required).